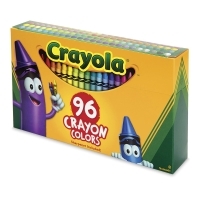 Crayola Crayons are famous for their rich, vibrant color. That's why Crayola is the name kids recognize in crayons. Standard crayons measure 3-5/8" long × 5/16" in diameter (92 mm × 8 mm). Sets are packaged in a tuck box, unless otherwise noted. 832-Piece, 64-Color Classpack — Celebrate the 50th anniversary of the 64-color crayon box with this Classpack featuring 13 reusable desktop bins. Each bin contains one set of 64 colors, including eight new 2008 Kids' Choice Colors chosen and named by kids. The Classpack also includes two classroom sharpeners. Set of 12 — Created in response to teacher and student requests, the 12-color set contains Red, Orange, Yellow, Blue, Green, Violet, Brown, Black, White, Gray, Carnation Pink, and Indigo. Set of 120 — Experience the colors that generations of children have grown up with — from Red, Yellow, and Blue, to Gold, Copper, and Silver, too! 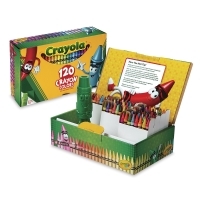 The set contains 120 crayons, each a different color. 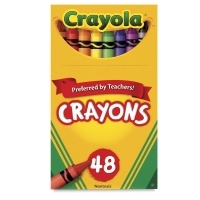 Ultimate Crayon Collection, Set of 152 — Please refer to the Item Specs tab for the full listing of included colors. 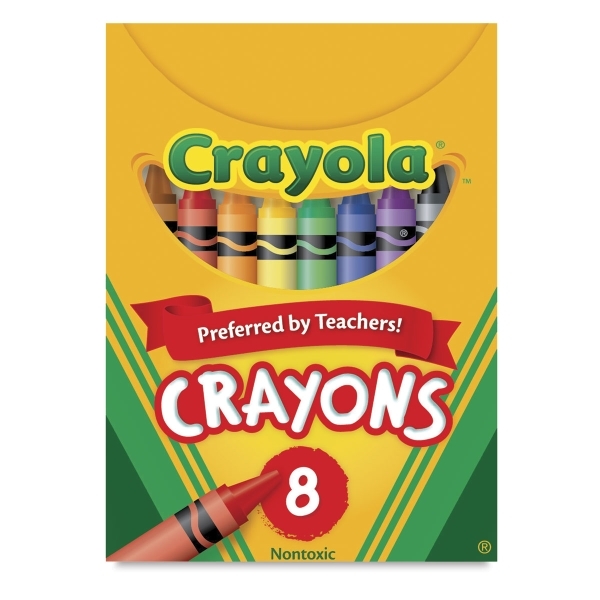 Crayons in Bulk — Replenish the most popular colors in sets and classroom packages as your children use them, break them, and lose them. Keep sets and classroom packs complete. 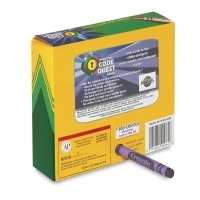 Purchase 12 crayons of one color in a tuck box. Set of 96 — Students can explore a full spectrum of color possibilities, encouraging creativity and flexibility. Flip-top box and tiered sleeves allow for easy access. Has a built-in sharpener. 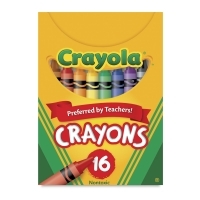 Set of 16 — The 16-color set contains the eight colors listed above, plus Blue-Green, Blue-Violet, Carnation Pink, Red-Orange, Red-Violet, White, Yellow-Green, and Yellow-Orange. 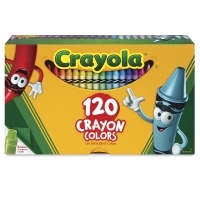 Set of 24 — The 24-color set contains the 16 colors listed above, plus Gray, Green-Blue, Green-Yellow, Orange-Red, Orange-Yellow, Peach, Violet-Blue, and Violet-Red. Set of 8 — The 8-color set contains Red, Orange, Yellow, Blue, Green, Violet, Brown, and Black. Set of 48 — The set of 48 colors contains 48 different colors, including Gold and Silver, in a hinged-top box. Multicultural Crayons — These expressive crayon colors are specially designed for hands-on learning about self, family, and community. The Set of 8 includes the colors Apricot, Burnt Sienna, Mahogany, Peach, Sepia, Tan, and Black and White for blending. 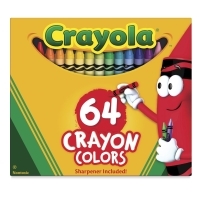 Set of 64 — This hinge-top box contains 64 colors, plus a built-in pencil sharpener.